What a great way to leave messages in the home or office. 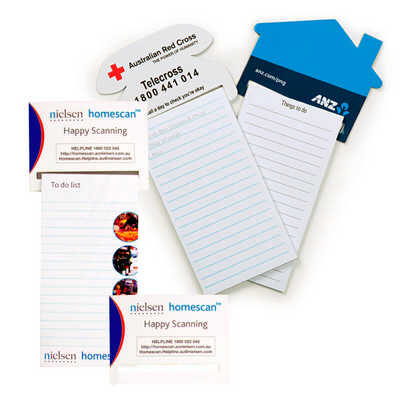 Comes with a 25 page note pad that can be custom printed to your requirements. Magnet shapes include a Van, House and Telephone. Add a pencil and clip to complete this great product for $0.45(G). Lead times are for in-house standard pad only. Variable-data printing (VDP) (Also known as variable-information printing (VIP) or VI) is a form of digital printing, including on-demand printing, in which elements such as text, graphics and images may be changed from one printed piece to the next, without stopping or slowing down the printing process and using information from a database or external file. For example, a set of labels, each with the same basic layout, can be printed with a different name on each label. Variable data printing is mainly used for direct marketing, customer relationship management, advertising, invoicing and applying addressing on selfmailers, brochures or postcard campaigns. Colours: 4 Colour Process (Magnet),?One Colour Black (Pad), Dimension: Standard Magnet - 95mm x 70mm Pad - 75mm x 140mm. Price includes : 3 Day Service 4 Colour Process - Pad - One Colour/Location. Setup is included.